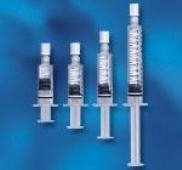 BD PosiFlush™ IV Flush Solution Sodium Chloride, Preservative Free 0.9% Intravenous Injection Prefilled Syringe 10 mL - This pre-filled syringe is designed to eliminate syringe-induced blood reflux. Features include color and bar code for easy identification verification, white label, and is preservative free. Sterile.